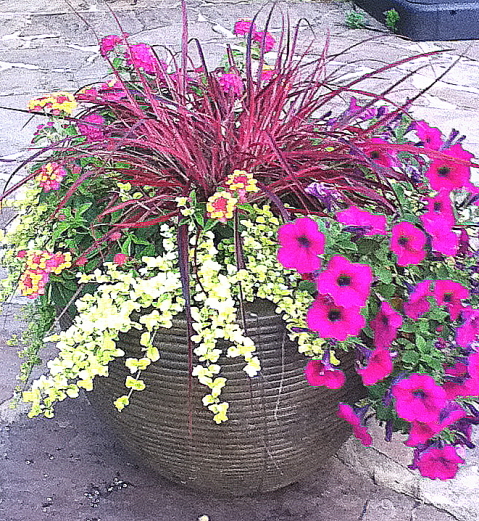 Mixed container plantings for summer color-part 3 of a series. – Johntheplantman's stories, musings, and gardening. Posted byJohn P.Schulz	 June 24, 2012 May 26, 2014 5 Comments on Mixed container plantings for summer color-part 3 of a series. I was telling Russ and Shala Head about the blog series and they offered to send me pictures or their plantings. Russ and Shala own and operate Willow Creek Nursery here in Rome, Georgia. 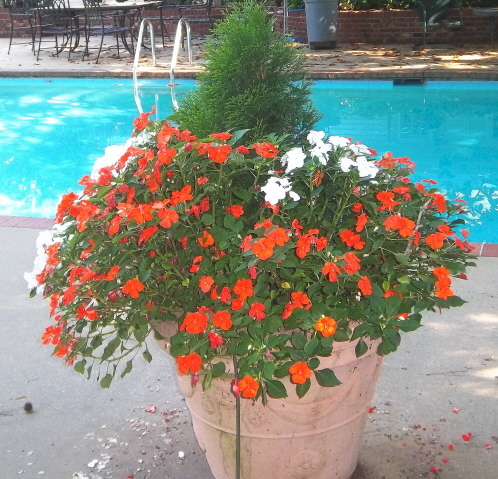 I have another friend, Bobby Mixon, who does very nice mixed planters for our mutual friend, Diane Harbin. I will start the pictures with those from Russ and Shala and then move on to those created by Bobby Mixon. Russ decided that we can not only include pots, but that we may also add a container built from rocks or other soil raising borders. 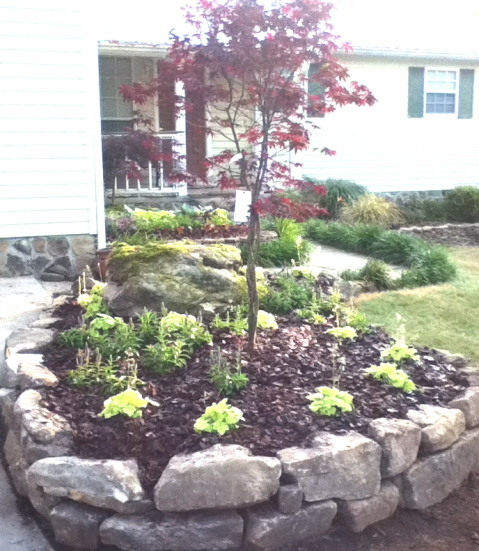 Here is one from the front of his house which contains a braided Bloodgood Japanese maple, tiramisu herchera, and purple veronica. He maintains that this garden is deer proof. I think a raised, rock bordered bed qualifies as a container. 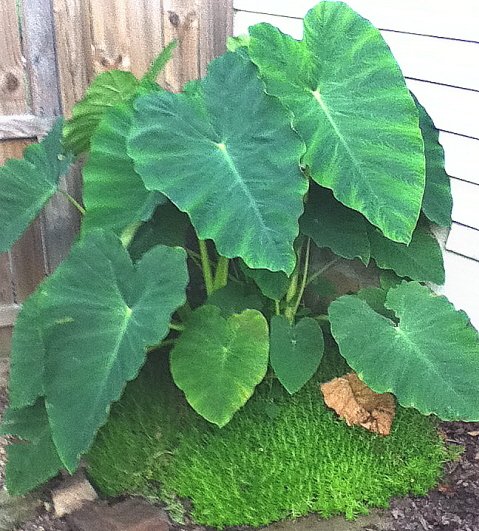 The container is hidden as this combination of elephant ear and trailing sedum grow out of bounds—as planned. Russ told me that this is his favorite combination. He wrote the varieties down on a piece of scrap paper for me. Fireworks pennisetum, mozelle lantana, golden pearls bacopa, and Neon purple wave petunia. The variety of bacopa is new to me and I will have to check it out. I dearly love white bacopa. ornamental grass, petunia, and a trailing plant give a good Ikebana effect. The picture below looks to me like it is made up of Cleome with a base of one kind of sedum and sitting in a base planting of a lower growing sedum. Sedums make excellent trailers and ground covers in and under pots. 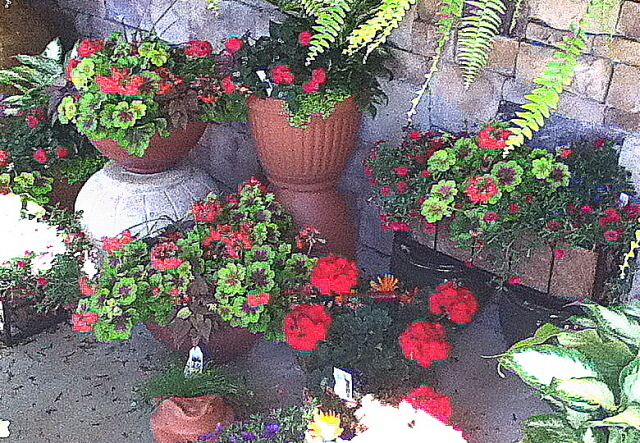 I really like this grouping of geranium containers. That’s all of Russ for now. I stopped to look at one of my own planters that I have had around for years. I enjoy cactus because of the ease of growing. I can keep this planter in the house and neglect it over the winter and then put it out in the sun for the summer and it will bloom over and over. 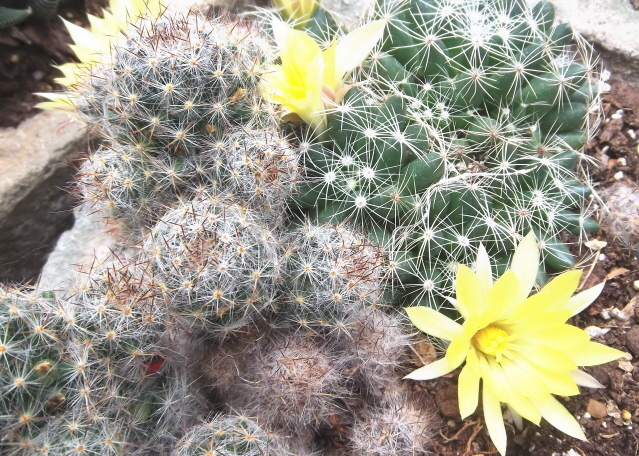 Cacti make interesting container gardens and may be kept through the winter in a bright location and treated with neglect. They will bloom year after year. Bobby Mixon is a retired public school teacher and he looks at container planting as a religion. He also breaks a lot of the rules, but he seems to get away with it. For instance, I have told him over and over again not to plant impatiens in the sun but every year he gets away with this combo of insence cedar and impatiens right out there in full sun. If I tried it, it would bake and die. 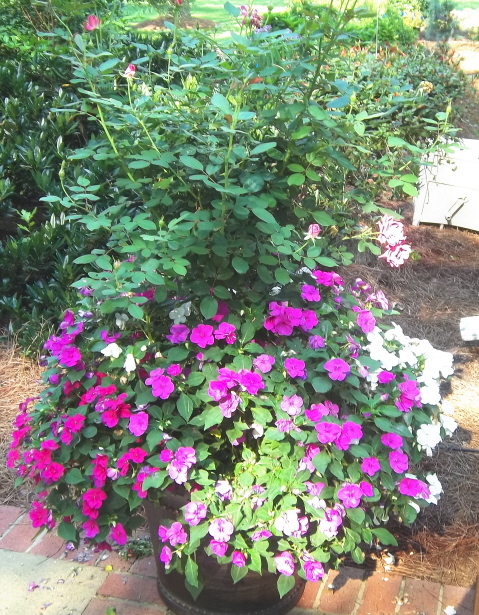 I keep telling Bobby that his impatiens won’d do well in the sun and he always makes a liar out of me. I don’t know how he does it. note the irrigation tubing. 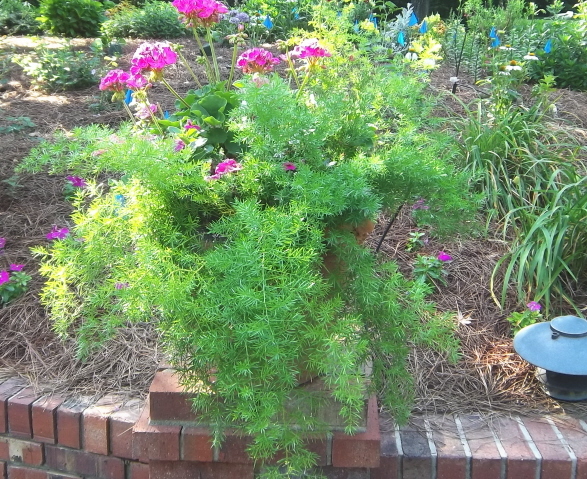 An asparagus fern does well with geraniums on a retaining wall. Diane keeps the asparagus fern over in her basement all winter and brings it out after the last frost. 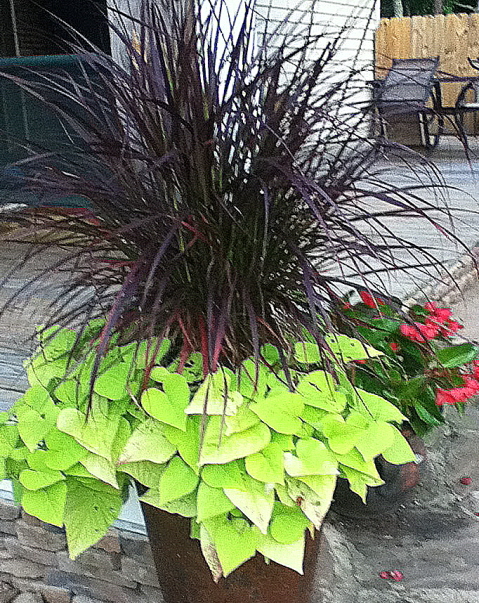 Geraniums and Asparagus fern do well together in a container with lots of light. a tree formed rose with impatiens. The rose needs a bit if pruning, but nice, nevertheless. For a shady location we have a hydrangea, impatiens, and variegated ivy. The hydrangea may be planted later in the yard to go through the winter and get big. 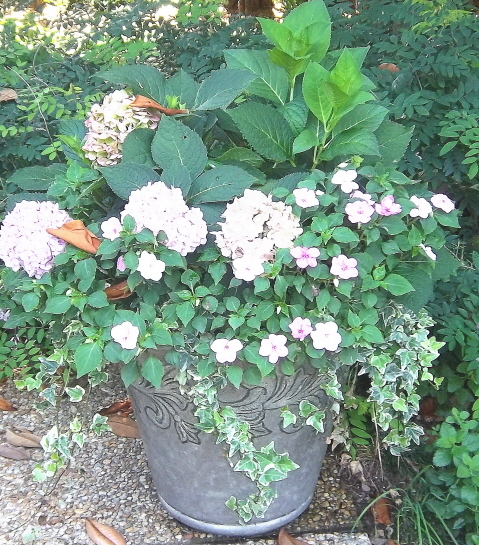 hydrangeas, impatiens, and variegated ivy in a mixed container for shade. 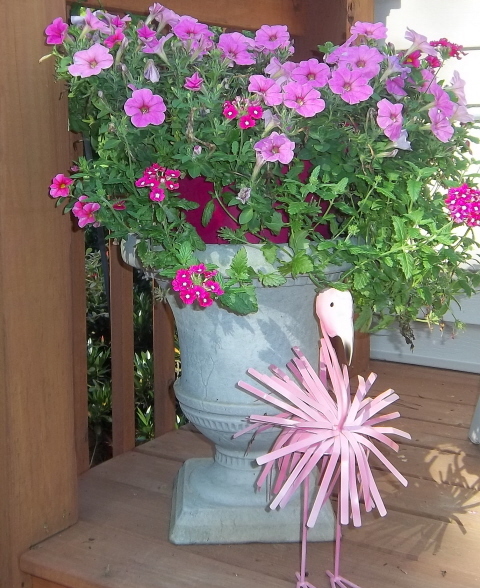 Finally, a petunia and verbena combination coupled with a designer pink flamenco. I like the touch of whimsy. That is one curious looking pink flamenco. These pictures may be a bit late in the year for now, but I’m going to store them and we’ll look at them again in early spring, next year. There’s always next year, right? Great collection of ideas for containers. 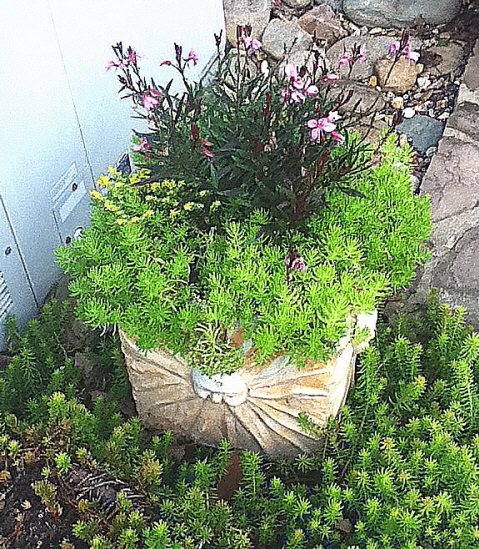 It’s hard to tell, but the container with sedum might have Gaura in the center (rather than cleome). Either would be nice. You are probaly right about the plant. I really need to get a new monitor. 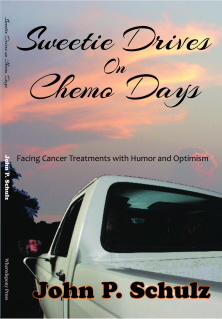 Thanks for your continued interest j. Your collective and group of flora and fauna gives me a warm feeling of proud jealousy, its absolutely gorgeous and well thought out. Gardening and proper landscaping can be a bit irritating if you haven’t the coordination, but you clearly do! Great snapshots, too.